RENOVATED KITCHEN & BATHROOMS including granite countertops, new cabinets, stainless appliances, sinks and lighting, FRESH PAINT THROUGHOUT, NEW LIVING ROOM FURNITURE, SAMSUNG HDTVs IN EVERY ROOM. You can always reach us. We love to talk to our guests! BEACH SERVICE is included in our rates. That is a $35/day value! You get dedicated beach service for the duration of your stay - 2 chaise lounges, 1 side table, and 1 umbrella set up daily for you. Sterling Beach is one of the newest and most luxurious Gulf-front resorts in Emerald Coast. It is located on Thomas Drive - the upscale and family-friendly east end of Panama City Beach by St.Andrews State Park (2 miles) and Bay Point Resort and Golf Club. Sterling Beach enjoys over 300 feet of beachfront. 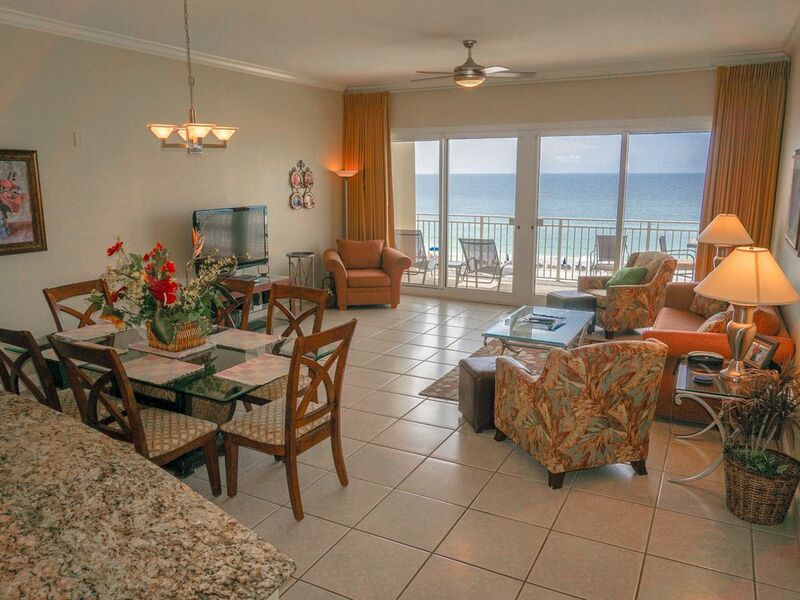 This luxurious 3BR/2BA unit is located directly overlooking the beach. The floor plan offers 1,800 sqft of space and 10” ceilings with crown molding. It boasts expansive views of the beach and pool from its wall-to-wall & floor-to ceiling windows as well as its oversized private balcony. This luxury 5-star condo is PROFESSIONALLY DECORATED in sophisticated West Indies theme with custom window and bed treatments, special art and accessories. The unit comfortably sleeps 8 – 1 king bed, 1 queen bed, 2 twin beds, and 1 queen sleeper sofa. The front master suit overlooks the Gulf and opens to the front balcony. It is furnished with a king bed, 2 nightstands, and an armoire. This master suite has a walk-in closet and an oversized private bathroom with its Jacuzzi tub, large walk-in shower with bench, and double sinks. It has a Samsung HDTV and DVD player. The 2nd bedroom has a queen bedroom set and it adjoins the hall bathroom making it its own private bathroom, if desired. It has a Samsung HDTV and DVD player. The 3rd bedroom has 2 twin beds, nightstand and chest of drawers – it is perfect for children or young adults. It has a Samsung HDTV and DVD player. The secondary bathroom is oversized with double sinks and tub shower. All stainless-steel new appliances equipped kitchen has an oversized granite counter with seating. It is a delight to prepare meals in this well-furnished epicurean kitchen while enjoying the view of the ocean. The dining table comfortably seats 6 while the counter bar provides seating for 3. The kitchen is well stocked to meet your dining needs. The entire condo is tiled - no more dirty carpets! Area rugs warm the floors. Ceiling fans are in Living Room as well as in all 3 bedrooms. The oversized 32’ x 8’ balcony runs the length of the Living Room and the Master Bedroom. It offers a dining table, 4 chairs, and 2 chaise lounges to enjoy the breath-taking panoramic view of the Gulf of Mexico. There is a separate utility room with large capacity washer and dryer and a large pantry adjacent to the kitchen. Towels and linens as well as a starter kit of dish soap/powder, laundry detergent, and toiletries are provided. Please bring beach towels. The unit comes with complimentary daily beach service. WE STRICTLY ENFORCE 'NO SMOKING' and 'NO PETS' POLICY. Renovated Kitchen with granite countertops, brand new cabinets, stainless steel appliances, sink and faucet. Dining Table comfortably seats 6. Counter seating for 3. Ocean Dreams is a fabulous condo. We spent our fall break with extended family. Ocean Dreams is one of the most spacious and well maintained condos we have vacationed in the area. We throughly enjoyed the sunrise and sunset from the oversized balcony with comfortable deck furniture. The Gulf of Mexico water was crystal clear and the free beach service was a very nice perk. We have small children and the convenience of staying directly on the beach and not having to cross a road was a life saver. Lastly, the owner was very attentive to our needs. We look forward to another stay at Ocean Dreams for our next beach vacation. We spent an amazing week at Ocean Dreams this past July. The condo was super spacious with beautiful furnishings and updates. My elderly parents enjoyed the oversized balcony with its gorgeous views of the ocean, while my family spent most of the day at the beach. The complimentary Beach Service the owner provided was a big plus. The owner was always very prompt and pleasant. Our week at Ocean Dreams was a dream. We spent a most relaxing and enjoyable week at this beautifully appointed condo. This was our fifth annual vacation at Sterling Beach resort. With its completely renovated kitchen and bathrooms, this unit was by far the best we have stayed in. Kitchen was fully equipped with everything we needed. It was delightful to cook while looking out to the blue ocean. We enjoyed our morning coffee and evening drinks on the spacious balcony and took in the stunning beach views. The owner was a pleasure to work with throughout the booking process and our stay. When the batteries on the TV remote were not working, she had building maintenance swap out with fresh batteries within 15 minutes of our text message. We just rebooked for next summer. This is the only condo we will stay at for our annual family vacation. We had the pleasure of staying in Ocean Dreams condo on Thomas Drive in Panama City Beach, Florida. We found the condo to be wonderfully decorated, spotless, and very spacious to accommodate our large family. The location of Ocean Dreams was perfect, situated directly on the beautiful Gulf of Mexico beach, and very accessible to many near-by attractions. We particularly enjoyed our scenic outing to Shell Island and the marinas close to Ocean Dreams. My kids very much enjoyed watching the fisherman return to the marina with their boats filled with bountiful fish. A highlight of our vacation at Ocean Dreams was the wonderful food and shopping we experienced at the nearby Pier Park entertainment venue. We have already made plans to return to Ocean Dreams. My brother, sisters and parents stayed at Sterling as well. Each of us with our own condo rentals, five in all. After everyone visited each others rooms it was unanimous that Ocean Dreams was the best equipped! The kitchen is amazing! We cook every meal in the unit so this made a world of difference to us! Very Clean! We loved the beach chair service as well! The Owners were quick to respond, very friendly and easy to communicate with! We would definitely like to stay here again! Our summer holiday vacation was great! The condo was exactly as it had been advertised...clean, spacious, comfortable and beautiful! The owner was very easy to work with and always responded quickly to any questions/needs that we had before the trip. We will definitely be returning in the future. I will keep your credit card info on file as security deposit instead of collecting funds. $500 will be authorized, but not charged to your credit card prior to check-in. I will not charge anything, unless there are reported damages and/or excessively dirty conditions by you and/or our cleaning crew upon your check-out.